Yesterday I went to the studio to work on my self-portrait, and here is how it looked at the end of the session. I took along my printout of the digital overlay (posted yesterday), and tried to make the same changes with oil bar on canvas that I had made with a cursor and digital pastel. I am struggling with the oil bars in every way, and nothing is easy, but I am learning. Yesterday I changed the position of the eyes and eyebrows, trying to account for the three-quarter view and the asymmetry of my face. Right now this portrait shows a bit too much asymmetry in the eyes, and I will try to fix that next time. I spent most of the time on the eyes, and I did a little bit with shadows around the nose. I was packing up to go home when I remembered that I forgot to change the lines of the hair (to show that the head is tilted) so I did that quickly at the last minute. 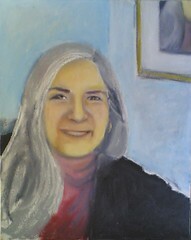 The portrait looks a lot better to me than it did on day 3, but there is still more to do. At this point, I have a better likeness in the digital overlay than in the actual painting (which is VERY frustrating, let me tell you), but I will keep going. To be continued. . . .